Sleep plays a vital role in good health and well-being throughout your life. Along with nutrition and exercise, good sleep is one of the pillars of good health. During sleep, your body is working to support healthy brain function and maintain your physical health. Getting adequate sleep improves cognition, concentration, memory, problem-solving skills, productivity, and performance. Results from a study on medical interns shows that interns on a “traditional schedule” made 36% more serious medical errors than interns on a schedule that allowed for more sleep. A different study found that inadequate sleep can negatively impact some aspects of brain function to a similar degree as alcohol intoxication. The Mental Health Foundation found that people that didn’t get enough sleep were 4 times more likely to suffer from lack of concentration. Sleep helps you control your emotions and behavior. It also helps with people cope with change. Sleep deficiency is linked to depression, suicide, and risk-taking behavior. The Mental Health Foundation found that those that are sleep deprived are 3 times more likely to be depressed and 2.6 times more likely to commit suicide. Results from an experimental sleep study found that sleep restriction affects blood sugar and reduces insulin sensitivity. In a study of healthy young men, restricting sleep to 4 hours per night for 6 nights in a row caused symptoms of pre-diabetes. This was then resolved after 1 week of increased sleep duration. Those sleeping less than 6 hours per night have repeatedly been shown to be at an increased risk for developing type 2 diabetes. Sleep is involved in healing and repairing your heart and blood vessels. A review of 15 studies found that short sleepers are at a far greater risk of heart disease or stroke than those who sleep 7 to 8 hours per night. A study completed at the University of Warwick found that getting less than 6 hours of sleep on a continuous basis makes you 48% more likely to die of heart disease and 15% more likely in developing a stroke. They also found that if you are over the age of 65, you are 83% more likely to have hypertension which increases the risk of heart attack and stroke. Studies show that people with short sleep duration tend to weigh significantly more than those who get adequate sleep. In fact, researchers have found that short sleep duration is one of the strongest risk factors for obesity. Sleep helps maintain a healthy balance of the hormones that make you feel hungry (ghrelin) or full (leptin). When you don’t get enough sleep, your grehlin levels increase and leptin levels decrease. Being well-rested could help you feel less hungry. Even a small loss of sleep has been shown to impair immune function. If you’re sleep deficient, you may have trouble fighting common colds and infections. Studies show that those who slept less than 7 hours were almost 3 times more likely to develop a cold than those who slept 8 hours or more. Sleep loss is known to activate undesirable markers of inflammation and cell damage. Poor sleep has been strongly linked to long-term inflammation of the gastrointestinal tract. The sleep research team at Loughborough University found that those that sleep 7-9 hours each night live longer than those who sleep shorter or even longer. They state that you are 12% more likely to die over a 25 year period if you are not getting enough or are getting too much sleep. Furthermore, as mentioned above, ongoing sleep deficiency is linked to an increased risk of heart disease, kidney disease, hypertension, diabetes, and stroke. Sleep needs vary across ages and are especially impacted by lifestyle and health. Though research cannot pinpoint an exact amount of sleep needed by people at different ages, recommended windows have been identified among experts. Research suggests that adults need at least 7 to 8 hours of sleep each night to be well-rested. Recent national surveys show that 30% of US adults sleep fewer than 7 hours a night. Evaluate your bedroom to ensure ideal temperature, sound, and light. Most importantly, make sleep a priority. You must schedule sleep like any other daily activity, so put it on your “to-do list” and check it off each night! I’m sure you have heard it before: your body is made up of about 60% water. Your body depends on water to survive. Therefore, it is extremely important to stay hydrated and replenish all that is lost. Did you know that by the time you feel thirsty, your body has lost more than 1% of its total water? So, let’s not wait until we feel thirsty! It will take your body (your bladder) some time to adjust to drinking more water than usual. But your body will adjust! The best thing you can do to avoid having to run to the bathroom constantly, is to spread out your consumption throughout the day. Take small sips periodically, rather than chugging large amounts at one time. Add some fruit! You can infuse your water with fresh fruit or fresh herbs. There are many ways to spice up the flavor of your water! Some ideas to try: cucumber mint, citrus blueberry, pineapple mint, watermelon basil, strawberry lemon, cherry lime, pineapple basil. These are all tasty options. Simply add sliced fruit and herb leaves to your water. Store in the refrigerator for at least 4 hours, and ta-dah! You have fruit infused water! Keep in mind, that your taste buds will adjust. If you dislike water now, stick with it. Your taste buds change often, and you may be able to tolerate plain water better, later down the line. The recommended amount of water varies from person to person. Some will require more, and other will require less (typically based on your current health status, your activity level, muscle mass, your size, and where you live). The current estimated requirement is for men to drink about 13 cups of water (3 liters) and women to drink about 9 cups daily (2.2 liters). You can also estimate your needs by taking your body weight and dividing it in half. That number is the amount of water in ounces that you should be drinking daily. For example, a 160-lb person should drinking 80 oz water each day. We also consume water as a component in various foods and other beverages. Watermelon, or other juicy fruits have high amounts of water in them. And of course, soups, coffee, tea, and other beverages have water as well. However, some of these foods have other components that can work in opposition to hydration. For example, caffeine is a diuretic that can actually dehydrate you. So the caffeine from your coffee or tea can actually hinder water's role in hydration. This is why it is important to drink plenty of plain water as well. A lack of water can lead to dehydration. Even mild dehydration can drain your energy and make you feel tired. A good indicator of dehydration is the color of your urine. The darker the color of urine, the more dehydrated you are. Normal colored urine is pale yellow. If you’re not used to drinking water, your urine will most likely be clear. Don’t worry, that is okay! Keeps your temperature normal (homeostasis). Lubricates and cushions your joints (helping to prevent arthritis). Helps with weight management. Drinking water fills you up and can lead to eating less. That’s right! Drinking water can help you lose weight! Drinking more water may cause you to replace the consumption of other beverages (that contain additional calories), leading to less caloric intake for the day. Drinking water can also help increase your metabolism, helping you burn more calories daily. Furthermore, the brain cannot differentiate the feeling of hunger and thirst. If you feel hungry, you may just be thirsty! So, drink up! Helps energize muscles (it is especially important to drink even more water when you are physically active). Helps with your kidney function. Helps reduce cavities and tooth decay. 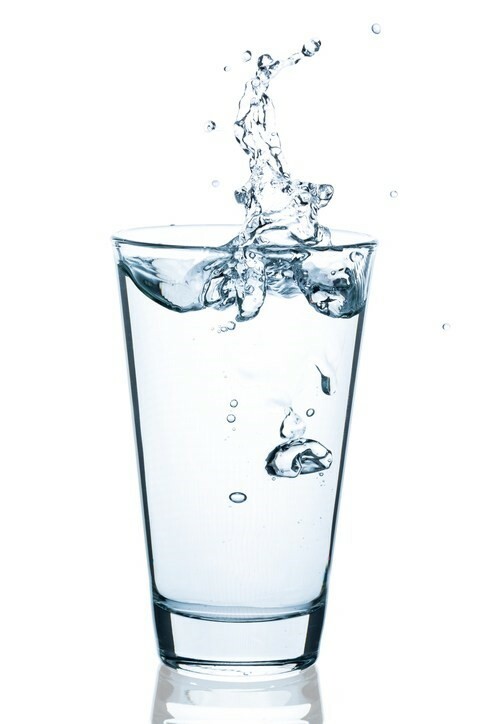 Water helps produce saliva, which keeps your mouth and teeth clean. Keep a water bottle on hand, full and ready to go; Keep a bottle in your car, at your desk, or in your bag. Drink out of a straw. You consume more when drinking through a straw! Infuse your water with fresh fruit and herbs if you dislike the taste of regular water. Set an alarm or small goals throughout the day. For example: by noon, make sure you already consumed 20 ounces of water. Buddy up and hold one another accountable. Unscrambling the Confusion about Eggs: Are Eggs Healthy? It’s time to unscramble the confusion about eggs and whether or not they are healthy! Eggs have received a great deal of criticism over the years; many have argued that these high-cholesterol yolks increase the risk of heart disease. However, with the updated 2015 Dietary Guidelines for Americans, our view of egg health requires a shift. Omelet-ya know all about eggs and why they can be part of a healthy diet. So let’s get crackin’! We have all heard it before and we will hear it again: eat your fruits and vegetables. This post highlights the importance of fiber in foods and the immense health benefits that come along with this superstar nutrient! The FDA has finally banned trans fats! This post discusses what this means for you as a consumer, how to avoid trans fats before they are officially out of our food system (not until 2018), how trans fats are different from saturated and unsaturated fats, and also suggests healthier options that you can incorporate in you daily meals. "Fasted cardio" has become widely popular among fitness enthusiasts and athletes. This post reviews scientific research that shows otherwise. Fasted cardio is not beneficial for fat loss; this is a myth. When making lifestyle decisions, focus on the evidence, not the opinions! Food Safety: Don't Buy These Foods! The food supply system is like any other business; profit is the focus. Unfortunately, their profit is our loss; we as consumers must be aware of where our food is coming from. Labels are tricky and are not designed to make it easy for you! This post shares the unfortunate happenings and unregulation of the treatment of some of the foods that are sold in our neighborhood grocery stores. After reading this post, you will learn how to avoid the trickery of labels, some food brands to avoid, and learn how to advocate for yourself in this dog-eats-dog kind of world.